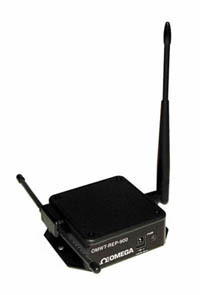 The OMWT-REP-900 Wireless Repeater is a 418 MHz RF receiver with an integrated 900 MHz transceiver.It receives CRC-16 error-checked data packets from all OMWT Series 418 MHz Wireless Transmitters and other 900 MHz transceivers within its range,and then transmits the data via the built-in 900 MHz radio to an OMWT-XREC-SER or OMWT-XREC-MOD receiver.Data received by the OMWT-XREC-SER receiver with serial interface can be displayed and logged using the OMWT-SOFT Software. By utilizing 900 MHz frequency,the OMWT-REP allows the range of the OMWT Series Wireless Transmitters to be extended up to 395 m (1300') indoors and up to 20 miles outdoors. The OMWT-REP-900 repeater is supplied standard with a 1/2 wave monopole antenna.For longer distance outdoor use,optional Omni-Directional and YAGI directional line-of-site antennas are available. Since the radio transceivers can be individually addressed for networks,several OMWT-REP repeaters can be used to link clusters of OMWT Series Wireless Transmitters to a centrally located OMWT-XREC-SER or OMWT-XREC-MOD receiver. 참고: Each wireless repeater includes 1/2 wave antenna and 110 Vac adaptor and complete operator’s manual. * Additional antennas are available. Contact the Data Aquisition Engineering Department.